BEIJING — China criticized India on Wednesday for allowing the Dalai Lama to visit a disputed border region, saying it did not consider the matter a purely internal Indian affair and warning it would damage bilateral relations. Foreign Ministry spokeswoman Hua Chunying told reporters that the visit by the exiled Tibetan Buddhist leader "severely harms China's interests and the China-India relationship." Hua rejected arguments that the trip was solely religious in nature, and said China would lodge a formal protest with New Delhi. India "in disregard of China's concerns, invited the Dalai Lama to visit the disputed border area between China and India," Hua said. In doing so, India had violated its commitments to China on Tibet-related issues, a move that would "stir up troubles over the border issue and go against the sound development of bilateral ties," she said. Hua said China adhered to the principle of not interfering in other countries internal affairs, but the Dalai Lama's visit "is not an internal matter anymore." India said Tuesday that China should not interfere in its domestic issues, as the Dalai Lama began a weeklong visit to Arunachal Pradesh in India's remote northeast. The 81-year-old monk was greeted by cheering supporters as he arrived in the partly ethnically Tibetan Himalayan state that China claims as its own territory. "Arunachal Pradesh is an inseparable part of India and China should not object to the Dalai Lama's visit and interfere in India's internal affairs," Rijiju said. The visit is the Dalai Lama's seventh to Arunachal Pradesh and his first since 2009. China has criticized previous visits, but they did not spark any major rift between the two nuclear-armed Asian giants. The Dalai Lama fled to India in 1959 amid an uprising against Chinese rule in Tibet, which Communist forces had occupied earlier in the decade. 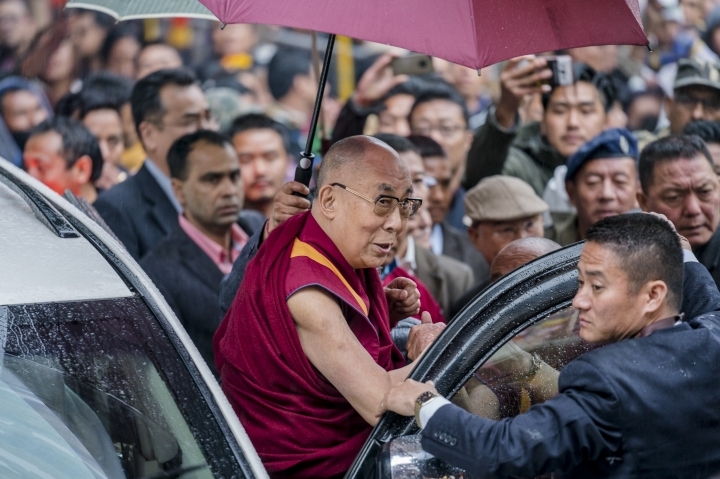 China considers him a separatist seeking Tibet's independence, while the Dalai Lama says he merely advocates substantial autonomy and protection of the region's native Buddhist culture. The Dalai Lama is to travel to the district of Tawang on Thursday, where he is scheduled to consecrate a monastery and address his followers. People from nearby areas, including from the Himalayan country of Bhutan, which borders Arunachal Pradesh, were already gathering at Tawang, local officials said. The border between the two Asian giants remains tense more than 50 years after they fought a brief but bloody war high in the peaks. China claims about 90,000 square kilometers (35,000 square miles) in Arunachal Pradesh, while India says China is occupying 38,000 square kilometers (15,000 square miles) of its territory on the Aksai Chin plateau.